Sadly, our hunger led us astray. 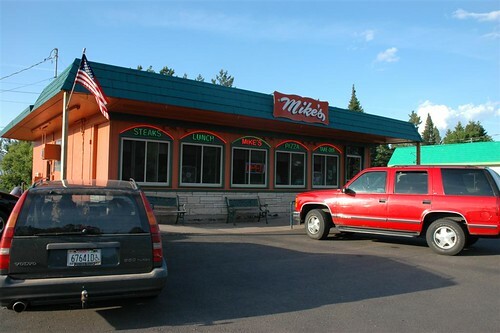 Mike’s had been promoted as a restaurant/diner that offered large portions. Diners wouldn’t, we were given to understand, leave hungry. Readers, remember: when a restaurant is only spoken of as offering a lot of food, please consider the idea that what they make up in quantity, they may lack in quality. Mike’s was small, but we’ve eaten in small places before. 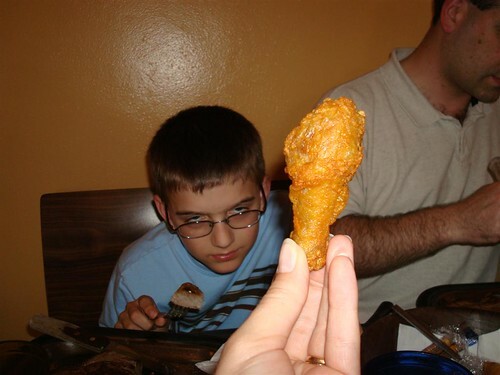 We got cozy at a corner booth and Katherine’s shins were treated to the slings and arrows of the younger boy’s feet—he having the unfortunate tendency to forget that he was not, actually, sitting alone in the middle of a football-field-sized table under which he could swing his sneakers with impunity. We had, naturally, seated ourselves (that being the Michigan way). We also grabbed our own menus. The lone waitress eventually moseyed over and we placed our drink orders. It’s worth noting that this was about the third restaurant in Michigan that did not offer a list of drinks on their menu. Owners, please, for the love of diners everywhere: list your beverages! Not only is the waitress typically hovering at one’s elbow immediately, asking, “What would you like to drink,” one can’t even stall by making the other diners order first while one peruses the list and frantically tries to calculate how much caffeine one has already consumed and whether a cherry cola of some stripe will actually make one’s heart pound loudly enough to wake people in the next hotel room over. This small hurdle passed, we had plenty of time to think about what we might like to eat. Chris had time to contemplate the fact that there was no sweetener for his iced tea. When the waitress hove near again, we placed our orders (and asked for sweetener). The salads arrived quickly enough, though oddly garnished: garbanzo and pinto beans, black and green olives, pepperoncinis, and what appeared to be pickled green beans and broccoli atop shredded iceberg lettuce. Though Andy had ordered ranch, Katherine blue cheese, and Chris Italian, all three salad dressings looked alike. A bread basket was proffered, with soft Italian-style bread, hard sesame breadsticks, a knife, and…no butter. Or margarine. Or oleo. Or olive oil. Or, in fact, any sort of small-capstone-of-the-dietary-pyramid with which to grease the bread. Chris did use the knife to hack open the seemingly-hermetically-sealed bread slices. I draw the veil over the rest of the meal, except to say this: we didn’t leave hungry. But we certainly didn’t leave fulfilled, either.